We now have a wider selection of sizes available. This very useful, heavy-duty food carrier has been a timeless classic long before it was mentioned in Saveur's Top 100, and by Food Network in their Great Giving Top 15 Gadgets. Grist Magazine also did a short story about them as they're good for the environment. 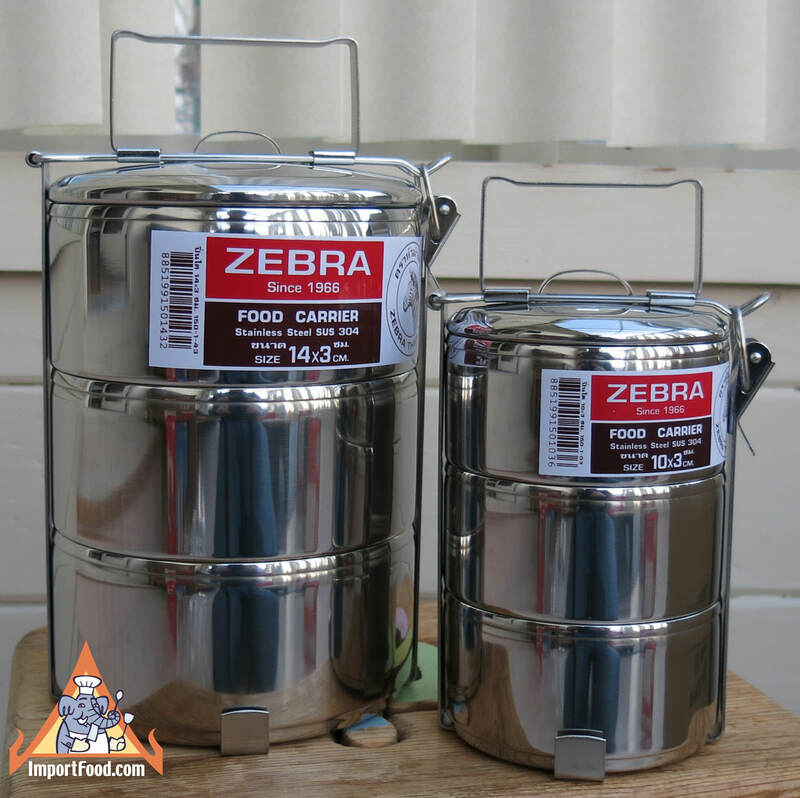 As everyone becomes more concerned about ways to reduce waste, this product is a great choice for people who may otherwise use disposable lunchboxes, or perhaps a family looking to carry a lot of food on picnics but use the least amount of space. It's also a nice way to promote healthy eating, and an age-old lunchbox used throughout Asia. 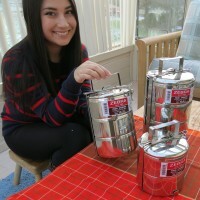 There are interlocking bowls and a single lid on top, held together tightly with a separate handle/clamp/bracket as shown. The bowls are not completely leak-proof but for thick sauces it won't be a problem, and it's meant to stand upright. 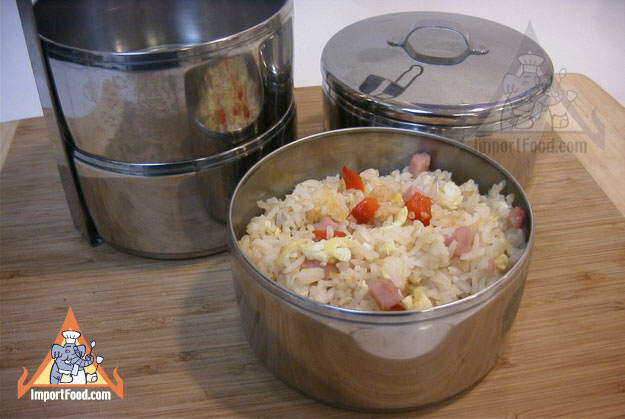 Add vegetables in one level, rice in another, spaghetti, sandwiches, cold-cuts, whatever you prefer. 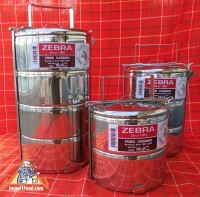 It's a versatile container made of the finest quality stainless steel by Zebra Thailand, and machined to precise standards. 2 Level 14 cm is 8" tall x 5.5" diameter, with two separate 3.5 cup capacity bowls. 3 Level 16 cm is 10.5" tall x 6.5" diameter, with three separate 5.5 cup capacity bowls. 3 Level 14 cm is 10.5" tall x 5.5" diameter, with three separate 3.5 cup capacity bowls. 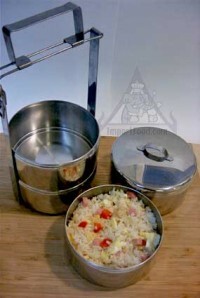 3 Level 10 cm is 8" tall x 4" diameter, with three separate 1.5 cup capacity bowls. 4 Level 16 cm is 13" tall x 6.5" diameter, with four separate 5.5 cup capacity bowls. Our customer Elizabeth in Boone NC sent the following comment to us via email: "I am really impressed with the excellent quality and versatility of the Thai food-tiffin! And thank you for the exceptional service when I called, and also for the speedy response to my order. Everything was perfect!". 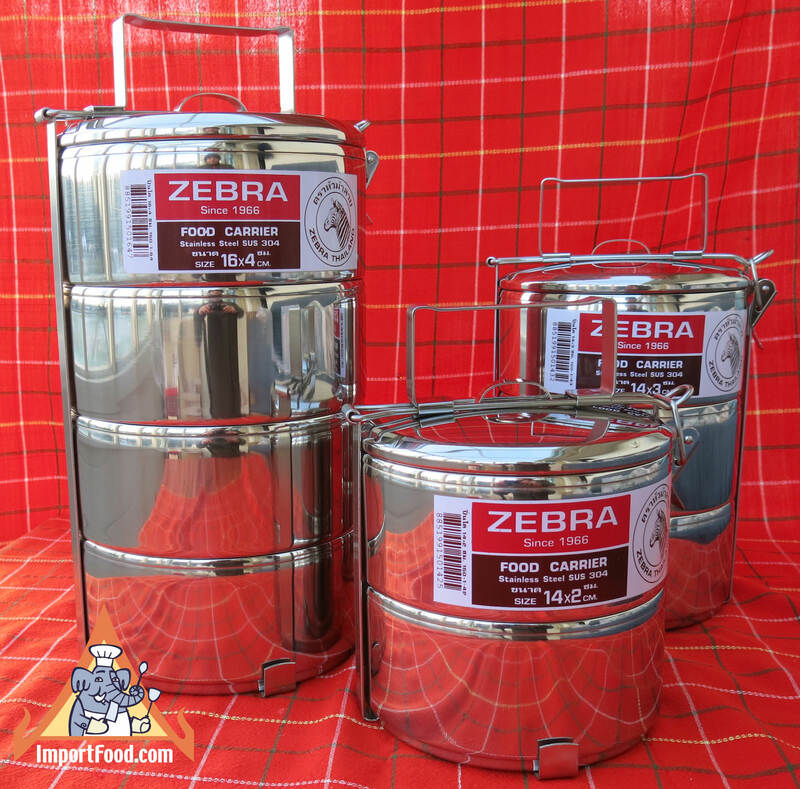 From Karen in Port Richey FL (she purchased one 3 level 16 cm, and one 3 level 10 cm): "My package arrived today and, wow, are the Zebra tiffins gorgeous! 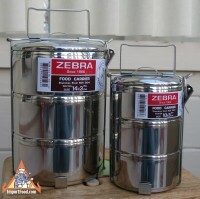 I think they're perfect for my intentions (meals in the larger, snacks in the smaller). Thank you so much for the careful packaging. Thanks again for all your help. Have a great day!"